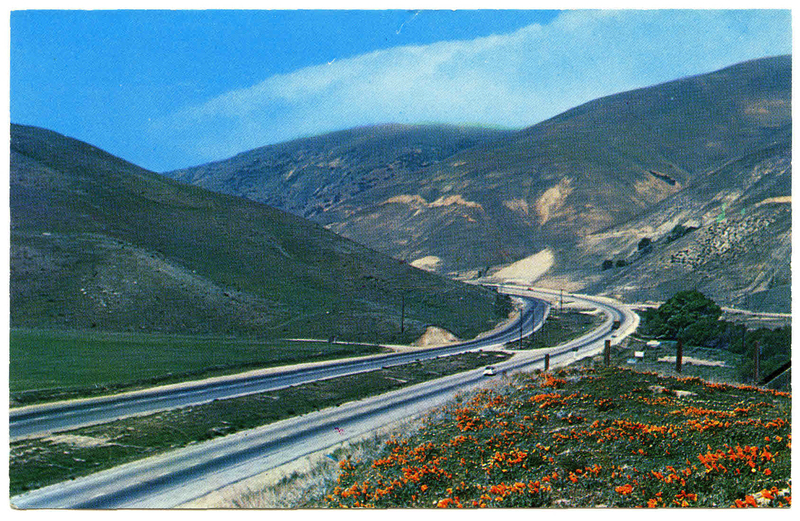 SCVHistory.com al2051 | Ridge Route | Approaching the Grapevine on U.S. Highway 99, 1950s-60s. "The Grapevine" Highway 99 between Los Angeles and Bakersfield, California. This is the world famous "Ridge Route," and is today a beautiful four lane divided highway with an easy grade. Color photo by Max Mahan / Published and Distributed by Columbia Wholesale Supply, 11401 Chandler, North Hollywood, Calif.
AL2051: 9600 dpi jpeg from original postcard, collection of Alan Pollack.